On March 22, the BakerRipley Gulfton Sharpstown Campus was buzzing with talk of how agencies can collaborate to better serve our immigrant population during times of crisis like Hurricane Harvey. 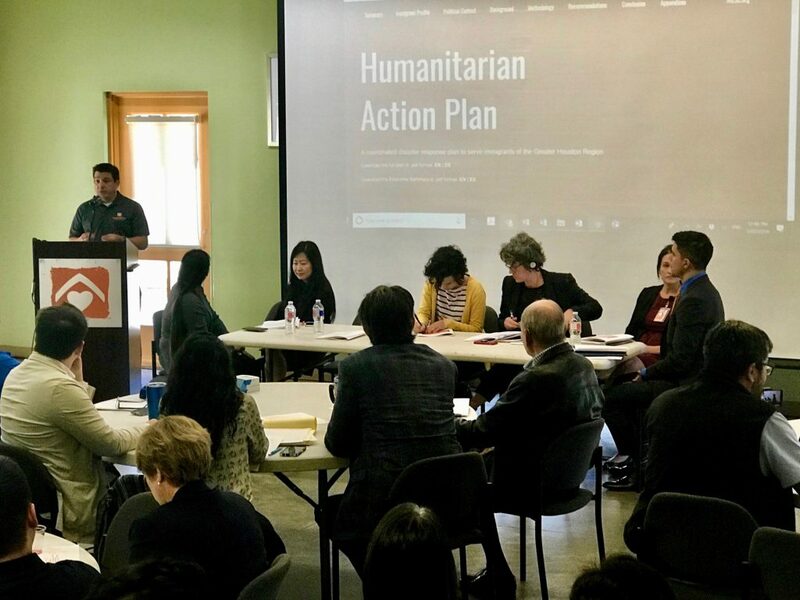 The Houston Immigration Legal Services (HILSC) launched their Humanitarian Action Plan with a list of recommendations for agencies to follow during disasters. Rene Solis, Chief Program Officer for BakerRipley. When Hurricane Harvey devastated our region, BakerRipley knew that local response had to be swift and immediate in order for the region to rebuild. We bring over 112 years of working in communities and 15 years of experience to our disaster recovery work. … and to meet people where they are. After all, ‘people’ are at the core of the choices we make. When we got the call to set up the NRG Center Shelter, we stepped up for all of our neighbors when called upon – embodying the “Houston Strong” mantra – because that’s what we do! 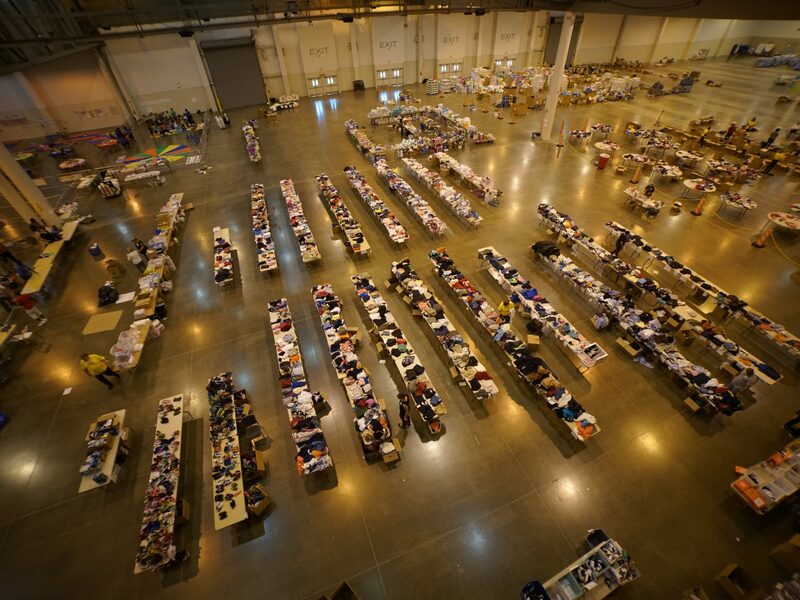 Through our work in disaster recovery, at the NRG Center Shelter and in our long-term efforts, we worked with our partners, staff and volunteers to set up valuable resources for our guests. In less than 24 hours, BakerRipley opened a mass shelter at NRG Center and welcomed over 7,400 guests who spoke 16 different languages during our 25-day deployment. Because we had so much diversity at our centers, we made an effort to provide translation and legal services. Many had lost their immigration documents in the flood and needed to learn how to obtain replacements. 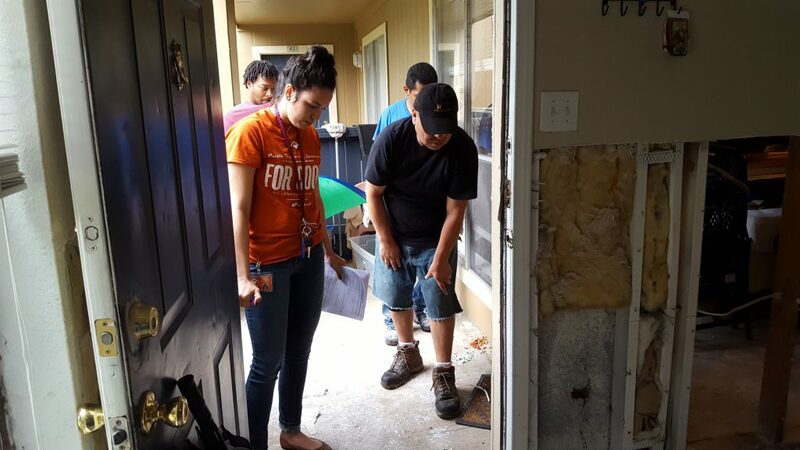 Both, translations and legal services continued to be a huge need post-disaster at our six BakerRipley-managed Neighborhood Restoration Centers through the beginning of this year. During and after Harvey, we also witnessed the importance of the HILSC Immigration Rights Hotline for our neighbors. Those calling the hotline number were concerned about FEMA eligibility, paperwork they had lost in the flood, and immigration court dates they had missed. Throughout our work in disaster recovery, and in everything we do, no matter where people come from, no matter their immigration status, our resources and opportunities are available and we will serve everyone. BakerRipley exists to make this region a welcoming place of opportunity for everyone and to protect and serve those who walk through our doors. We serve 600,000 people across 65 locations annually. Our core beliefs about people and communities guide us daily as well as through times of crisis. We learned in our disaster recovery work that collaboration is key to ensure a quick recovery during times of crisis and now – as we prepare together for the next disaster. We respect HILCS position to create this plan that gives agencies a roadmap to guide us in working together to serve and protect our most vulnerable populations, especially our immigrant community, during times of natural disasters. HILSC shares our vision of inclusion for all and BakerRipley has been a member of the Collaborative since 2014.